I always wanted to make Disney Cuties characters since long time ago but always forgot about it. So today I made one. I chose Minnie Mouse for my daughter's bento. When she was younger, she loved to watch Disney movies. But now although she still watch Disney Channel but her orientation has changed to the teen Disney movies like the Camp Rock and Hanna Montana. So before she say NO to Minnie Mouse, I decided to make Minnie bento for her. Minnie Mouse was made of egg sheet and nori. I wanted to use cheese instead of egg sheet but it was just impossible for me to do that. I think the cheese will melt quickly because this week is quite sunny and hot day after last week rainy days. I hope all of you don't get bored to see my bento because I often use egg sheet to make a character. I added ume somen and egg flowers for decoration too. I was inspired by Sheri's ume somen bento. So far, I found 4 colors for somen : regular somen (off white), cha somen (green), ume somen (pink) and egg somen (yellow). Inside the dark green box : crispy fried chicken, lemon, carrots, grape tomatoes, stir fry cauliflower & chayote, and mun tofu. I linked this bento up for What's For Lunch at Shannon's blog. Many bento friends has joined up the Pink October event organized by Bento Blog. You can check all the links here. its me 3sna. your fellow friend on multiply. kindly i always peeping your site to see your bento creation and read all the journal. All your bento creation is adorable and make me droolling. I love the taste, colour also the story behind it.. SO cute Lia!! What a darling Disney baby :) What did you and A think of the ume somen? I found it a bit sweet. Super pretty color though, so I'll use it again. i don't get bored seeing your bentos but I do get very envy over your perfect eggsheets.. sob .. sob.. I would never get bored seeing your cute yet stunning bentos.... I love visiting your blog and just love looking at all your bento posts to get some inspiration ... Thanks Lia! So sweet, Lia! Ben was always a huge Mickey fan, he still watches it sometimes. I will miss it as he gets older. is your Sakura pedals made from pink egg sheets? ya.. i agree with others you make the smoothest eggsheet. ya.. kids grows up so fast right? 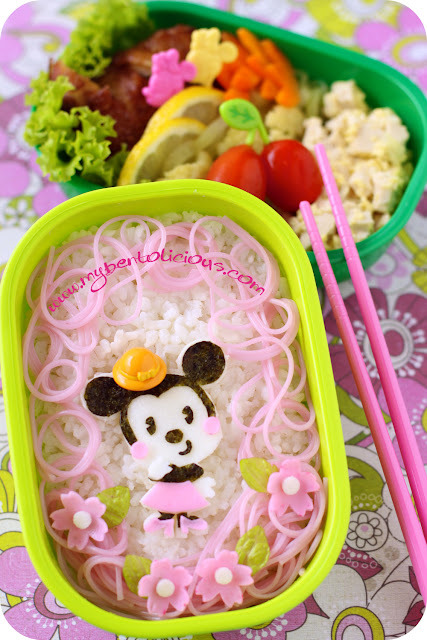 think you will be making Miley cyrus bento soon.. haha..
pretty and sweet baby Minnie...! Yes Lia, both of us using the same ume soumen today. Yours is a lovely bento, really cute. Love it! Do you have a tutorial on making good egg sheets? Oh yes, and HOLY COW, THAT'S GORGEOUS! @Journal Mommy Yenny : Thanks a lot Yen! Lovely bento, so perfect egg-sheets.. you are the best with them! @Emily Ng : Thanks a lot Emily! How do you come up with such creative beauty every time? Jaw dropping, Lia! You are SO talented!! Today, I saw 2 posts that used pink noodles. What a coincidence! I guess October is the month of breast cancer awareness. Lovely bento as always! I wish that my triple C can be a part of your bento. I love looking at your bentos. This one is so much fun with the pink swirls all around the lovely minie! Keep them coming! Fabulous!! Better not let my girls see this one or i'll be in the kitchen for hours..lol It's perfect! @Lyndsey : Thank you so much Lyndsey! @Mommyof2girlz : The girls always love pink I think hehehe ... Thanks a lot Steph! @Kids Dream Work : Thanks a lot Ai Ping! This is really so cute! I'll try to make a Minnie for my daughter one of these days!! !